When it calls for a social media network filled with corporate profiles and business centric ideology, LinkedIn is the first thing that would come to your mind. The fast-growing digital business world and pretty much the how-impressive-is-your-portfolio website has garnered over 450 million members. Every popular brand or company, may it be Facebook or Twitter has a LinkedIn page. All of this social proof is enough to establish the importance of LinkedIn as your B2B market trendsetter. 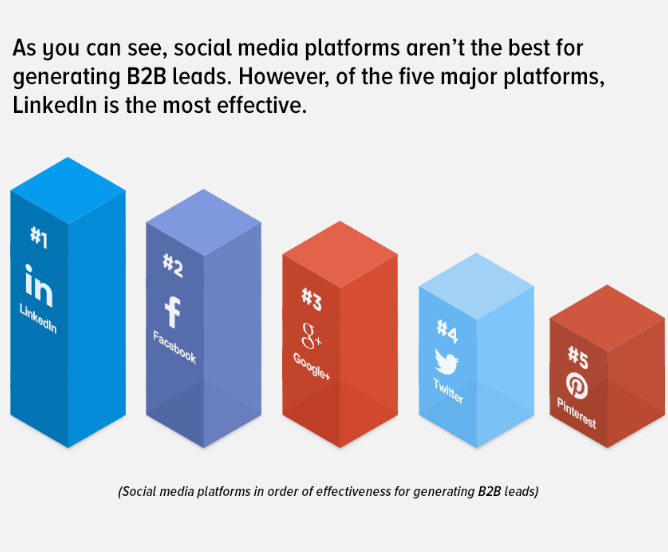 LinkedIn also proves to be the most successful among all other social networks of similar scale such as Twitter, Facebook, Pinterest and Google Plus. So, there are fine opportunities waiting at LinkedIn for you and you must grab them. The hurdle in the way is that reaching out to people on LinkedIn isn’t as straightforward. It requires smart and tactful marketing, that can help you get recognized as a entity of value. Same can be viewed at our Founder-Partner Chhavi’s LinkedIn Profile with more than 1100 followers and tons of quality connections. We’d like to reveal 5 of the best marketing tactics on LinkedIn that will help in increasing your company’s social worth and ultimately get more leads out of your LinkedIn account. When someone visits your Linkedin company page, they can either read a boring “about us” or actually get tempted to contact you. The latter is in your hand. One simple way to do this is by making the overall look and appeal of the page speak for itself. This includes revamping your LinkedIn header image, description and display picture. Make your header image standout and describe what you do. Put in graphic imagery that clearly tells the visitor what your company is about. You can also put your latest offers or featured posts in your LinkedIn header. We advise to keep changing over time, to test out the maximum engagement rate. Most of the things about your company would be said in the first two lines or so. Therefore, you must keep a one line description at the top of your About Us, as you can see in the above image. If the visitor is hooked within the first two lines, you’ll have a fair share of the leads falling in your kitty. Remember that your company description needs to be a business pitch, rather than a factual biography of your organization. The first thing just after they go through your description is the Recent Updates section and your Website link. Place links of your most important landing pages at these places. Showcase page are a great way for LinkedIn company profiles to promote their focused lines of business. For instance, you could be a company that is into mobile app development and digital marketing alike, but your focus in on mobile app development. Therefore, you can create a showcase page linked to your company page that will showcase all the important details that the visitors need to know. 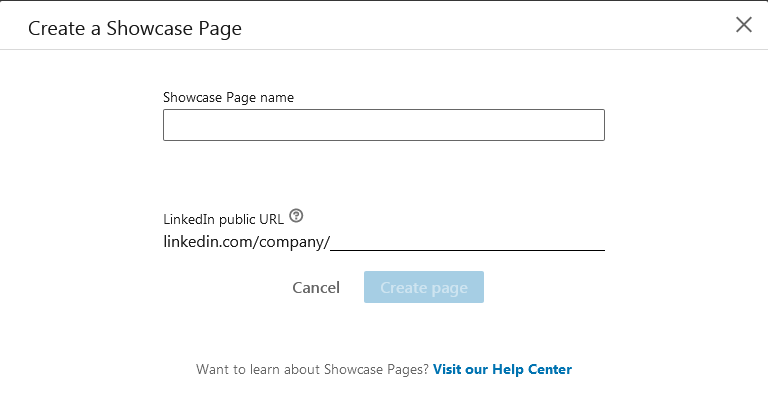 The Showcase page is equipped with its own set of tools such as custom name and shareable LinkedIn URL. You can create more than one showcase pages as well, if you want to promote more than one lines of business at once. 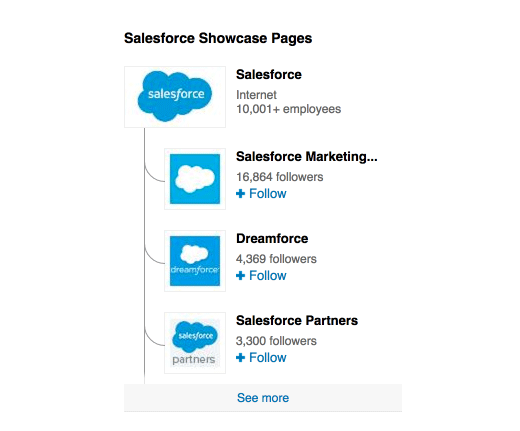 Salesforce does it well with their multifarious subsidiaries. LinkedIn is a lot about connecting with the right people and staying in the know of your targets. This is one place where LinkedIn advanced search really shines. You get to find relevant audience, whom you want to connect with easily using this feature. Find people who are more likely to avail your services and follow them. If nothing else, they’ll receive a notification about you following them and that’s a nice starting point for them to get to know about you. Moving ahead, you can try contacting certain members and talk to them about your services. But, in order to do that, you first have to find the right people, and LinkedIn advanced search provides for that. 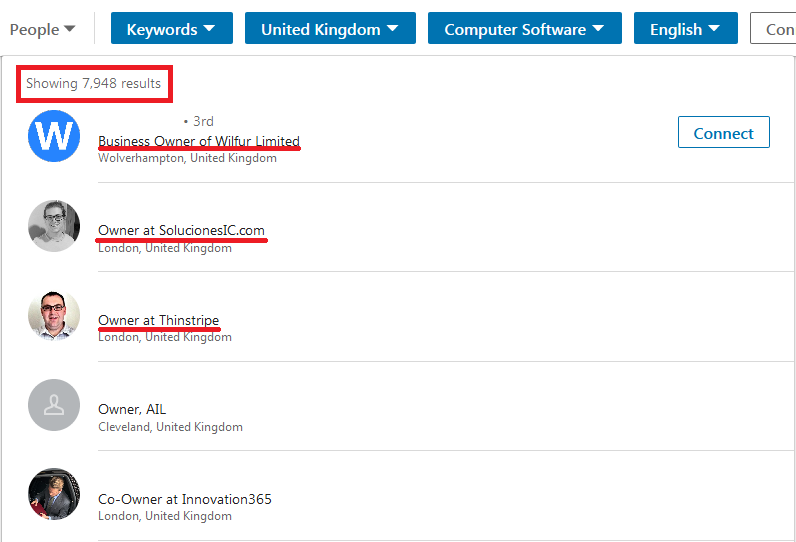 For instance, If we are to look for Business Owners in United Kingdom related to Computer Software Industry with English as the primary language, we get the following results. Now you can hunt down the best ones and start connecting to them one by one. Many of these businesses would be looking to launch an app for their business, or make a new website or may be searching for an outsourcing partner, and ding!, you’ll be there as a prospect! The group culture has recently evolved at LinkedIn, and it is here to stay. These groups discuss everything from latest industry trends to business opportunities. The best part is that when you publish something in a group, everyone gets an email update about your post. There are certain email updates that are always running around from LinkedIn groups that help you stay in touch with the latest buzz. There are more than 200,000 groups on LinkedIn, making it highly probable that there will be a group pertaining to your industry or niche. You can request to join these groups and get to sending out lead-worthy content and get noticed. 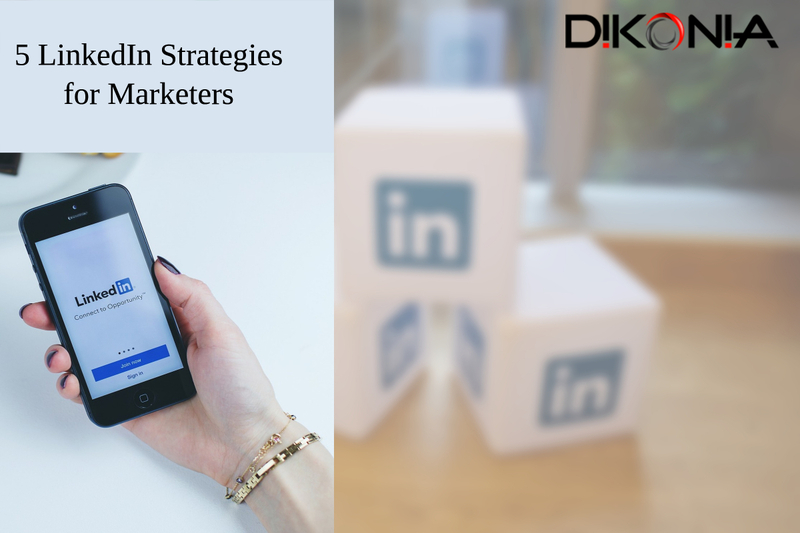 Publishing regular updates on LinkedIn is a great strategy to promote yourself as a thought leader of your niche. Why should you avoid or adopt the Moonlighting culture? How to make the transition from an employee to an employer? The good thing about publishing on LinkedIn is that you can bring in traffic from external sources as well from these articles. You can publish the links to LinkedIn articles on Facebook and Twitter, which will eventually market your company directly to the other side of your social circle. Twitter is yet another great platform for B2B marketing and when you combine LinkedIn with it, you get a nice shoot off in the user engagement.